Snow falling outside and icy window panes make you want to cuddle up inside with some hot cocoa…not move across the city. But while icy roads and snowy sidewalks can be a challenge, winter is one of the best times to move. Landlords are looking to fill vacant units, so rents are lowered, and slow season for moving companies often means you can get a discount. Plus all those post-holiday deals on furniture will make furnishing your new place easy. We all hope it doesn’t, but sometimes a bomb cyclone happens and your city’s fleet of six broken-down snowplows has to take responsibility for plowing the streets that are home to a million people. While it’s unlikely, you’ll want to prepare for this scenario. Talk to the landlord of your current place and your new place about what protocol is if there’s a last minute emergency that prevents you from moving. While you may need to pay extra if the situation does arise that you need to stay in your old place a little longer, you’ll be grateful to be out of the cold and not sliding through the snow. If your city ever gets snow, be ready to plow the morning of your move to have a large, clear path from your doorway to the moving truck – and maybe some extra space, too. Bostonians are masters of saving spaces with a cone (or lawn chair, or broken microwave, or anything, really) after they’ve shoveled out a spot, and if you have a move coming up, you should learn from their tricks. Plow out a space the morning of (or if you can, the night before) your move, then mark the space with traffic cones so no one takes it. A better, less aggressive option? Contact your city before you move about getting special parking signage that only allows you to park in that spot during your move. 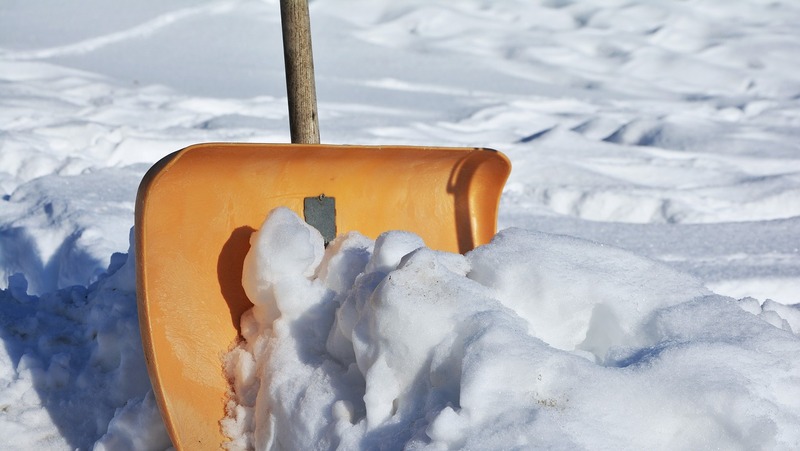 And don’t forget, you’ll need to shovel out a spot at your new place, too! If you want to survive the first night in your new home, clarify ahead of time with the power company that utilities at your new place are set up and turned on. Now, that doesn’t mean crank the heat the second you walk in the door. For the first few hours, when you’ll be moving items in and out, leave the heat turned to low (or off) to avoid it becoming a wasted expense as your door is left perpetually open. Likewise, once you’re up and moving in your old place, turn the heat off – you’ll likely be charged for that last day of utilities, so make it a cheaper one. Driving on icy roads is hard enough even in a sporty Subaru. In a rented moving truck, it’s nearly impossible. You put yourself at higher risk of getting in an accident (and in turn, raising your insurance premiums) when you drive a 10’ box truck down frozen city streets while moving in winter. Instead, opt for a service like Dolly that not only provides the truck, but also includes a quality driver who knows how to handle the roads. Before you start packing, pull out your toughest snow or hiking boots and set them aside for moving day. You’re going to want comfortable boots that will provide support, but won’t have you slipping on ice – regular sneakers just won’t do for a winter move. Prepare your attire as if you’re preparing to go out in a bomb cyclone: layers, layers, LAYERS! You’ll likely pull off the top layers after lifting your first piece of furniture, but when you’re standing outside of your new home, waiting for your movers to meet you there, you’ll be grateful for the extra warmth. Remember that time you took a phone call outside on a frigid winter day and your phone died even though it was at 95%? Electronics hate the cold. So from your laptop to your flatscreen, make sure nothing is left out, and blanket everything for some tightly-packed warmth. Even in the best weather, pets and moving generally don’t get along. It can be scary for an animal – especially one that’s spent most of its life living in one place – to be uprooted and go somewhere completely new. Have your pet spend moving day (and perhaps the day after you move, too) with a friend or relative who knows how to take care of them in the cold. And make sure you don’t pack up their winter gear too quickly: dog snow boots in particular are items you’ll want to keep on hand for easy access. Depending on what your winter move is like, you may be going three feet between your moving truck and your front door, or the distance might be three blocks. If it’s snowing or raining hard enough, that distance (not to mention the water that may get into your truck) may be enough to damage your stuff. Utilize airtight plastic bins for sheets, towels, and comforters, as well as oversized ziploc bags for clothes to keep your stuff warm and dry. And don’t forget to leave a few extra towels out to wipe all the dirty snow off your boxes. When moving, it’s always a good idea to have an “open immediately” box filled with items you’ll need within the first 24 hours in your new place. But considering just how cold it is outside in winter, you may want to prepare a few extra items to help you feel comfortable in your new place (despite the cold): hot tea and cocoa (and your water heater or microwave easily accessible to set up), extra blankets, dry socks and clothing layers, toiletries so you can take a hot shower, and a small space heater. Be prepared for your cold weather move with moving help you can rely on. 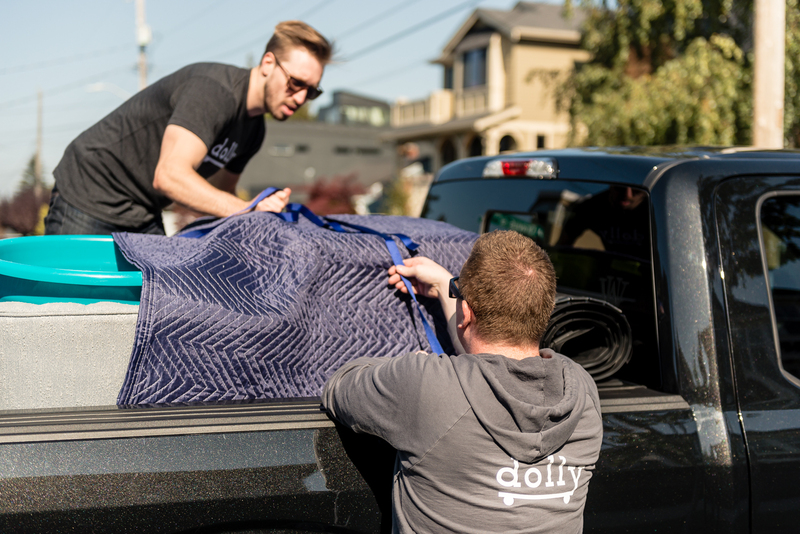 Dolly will bring truck and muscle so you can focus on turning up the thermostat and avoiding those ice streets while moving in winter.